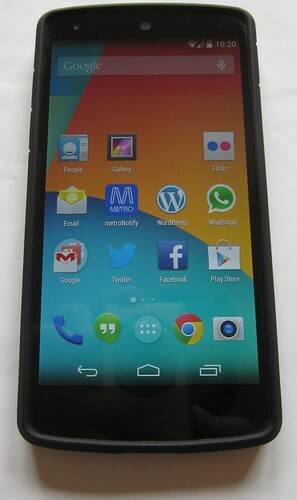 My new Google Nexus 5 phone is going very nicely, thanks very much. But I was pondering getting a case for it. The last thing I’d want is for it to be dropped and damaged. Fortuitously, the good people at MobileZap asked me if there was a product on their site I’d like to review for them. Why yes! Thank you! MobileZap stock lots of accessories for phones and other devices such as iPads, with everything sorted by manufacturer and model. Unlike some other sites I’ve looked at, they have quite a wide range, even for older models of phone such as ye olde HTC Desire S that I’ve just upgraded from, which is rather good if you’re wishing to hand it down to someone (it still works fine) but need a new case for it. In the category of Nexus 5 cases, they list 83 different products. I also like that MobileZap aren’t afraid to publish customer reviews on their site — even unfavourable ones. I thought the Spigen SGP Ultra Hybrid for Google Nexus 5 – Black sounded good. Not that the name exactly rolls off the tongue, but it looked like the case I needed. One of the things I like about the Nexus 5 is that it looks good. This case attempts, with some success, not to mess with the look of the phone. It leaves the front alone, providing bumper protection around the edge, so unless it hits a sharp edge on the screen, you’re protected. In fact it also comes with a screen protector, though I’m a little reluctant to fit it, given the phone itself comes with Gorilla Glass, which should make it pretty tough. (In fact the old HTC Desire S, which also has Gorilla Glass, managed to last two years without a noticeable scratch.) That said, I know these days good screen protectors are pretty good at not unduly affecting the touch of the touch screen, so I’ll give it a try at some stage. The outside edge of the cover (eg the bumper) is rubbery plasticy stuff, which (like the phone itself, at least the black version) is easy to grip, so the chances of it slipping out of your hand are minimal. The back of the cover is transparent plastic. This does detract a little from the rather nice natural look of the back of the phone, but it wouldn’t normally be facing that way, so I can live with that. As you’d expect, there are gaps in the case to allow for the camera to work, as well as the power/USB. The Volume Up/Down and Power buttons are covered by rubbery stuff which changes the feel of them just a little bit, as well as making them more accessible because the case buttons are bigger than the phone buttons – no bad thing. If there is one niggle, it’s this – the bigger Power button is now directly opposite the bigger Volume Down button, and if you’re used to holding the opposite side of the phone to press the Power, you may find yourself initially pressing the Volume Down instead. I found once I got get used to it, this didn’t cause me issues. Other than that, this looks like a good, durable case, and I feel less nervous now that my beautiful new phone will succumb to some horrible damage on probably inevitable day that it gets dropped. Many thanks to MobileZap for sending me this cover. Daniel, a good alternative to the crappy PTV app on Android is TripGo. I use it on my HTC One X and it gets you Bus, Train and tram, timetables all in the one app and all works to your current location so if there is a train station near you, you just tap it and it’ll take you to the timetable of that train station.